Click the image to view a slideshow featuring the announcements of the 2007 Light-Up McIntosh finalists sponsored by the Friends of McIntosh. 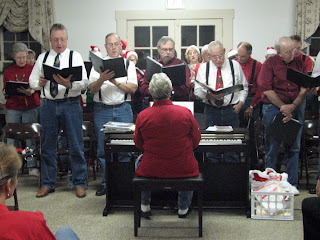 Christmas carols in the background were sung by the McIntosh Area Choir with the residents of McIntosh in the Civic Center earlier that evening. 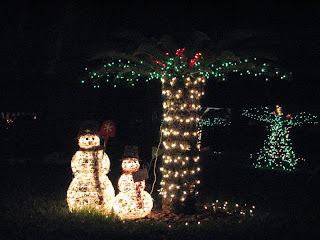 Editor's note: Some lights around town may or may not be featured, because photos are really hard to take in the dark. Believe it or not. There are many, MANY very nice holiday displays that I just couldn't get to come out. If your home or work isn't featured, please know this is reason. Click on the image to see a Soundslide of the McIntosh Area Choir's Christmas performance at the Civic Center. 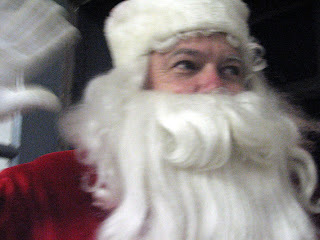 Click the image of Santa to open up a Soundslide with music and pictures from the Light-Up McIntosh festivities Saturday night. Editor's note: Two more Slideshows to come in the next couple days featuring Christmas lights, contest winners and more images of the choir. The McIntosh Town Council decided Thursday night to take the re-invest monies in several location after officials were finally able to full out of the State Board of Administration Local Government investment fund that had been frozen for a week. 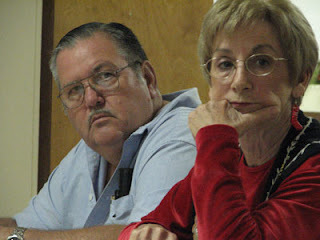 In the monthly meeting, Town Clerk Debbie Miller said the town was able to pull out $460,403.03 from the SBA accounts that had been frozen by Governor Crist after shaky investments caused a run on the bank by local governments. Miller said that the SBA still holds $77,352.69 of McIntosh's funds in what she said the investment group called "impaired investments." Whether or not McIntosh would lose this money, or part of this money, is unsure. Under advice from the town's auditor, Council members decided they invest the remaining funds in bank certificates of deposit in two banks separate from the bank the town uses for its checking account. Council member Eva Jo Callahan also asked Miller to see if the town could turn its checking account into a money market account, since the running balance can run from 40,000 to 60,000. Mayor Cary McCollum said the town's funds had been in CDs before they invested it in the SBA in the late 1980's. The Council passed an ordinance that spells out some of ambiguous policies about the town's water system. However, the new ordinance will allow the town to charge the mobile home parks and fish camps more money than they have in the past. Sportsman's Cove owner Casey Girardin spoke out against the ordinance since she said the former owners had an agreement with the town to pay for 31 permanent residences. The town is now charging her $90 more dollars. Girardin says some of her residences are not occupied. The new ordinance creates a method for residents living in homes to stop and start their water when they leave for the summer or long periods of time. However, the new ordinance does not not allow mobile home residents, and the owners of the parks, that privilege. The town passed a resolution designed to spell out its public record request policies. The new resolution allows the town to charge for the town clerk's time for records requested, making it more difficult, time consuming and expensive for residents to access information in their town office. The town will pay $125 to rent a piano for Saturday's Light-up McIntosh area-choir event, since the piano in the Civic Center has been neglected beyond repair and no longer functions. Kathlyne Walkup wrote the council members an e-mail informing them that the piano needs to be replaced, which could cost from $1,900 to $10,000. A new local choir has a need for the town's civic center to have a functioning, professional piano, she said. Council members indicated they hoped other civic organizations would help with the replacement and asked McCullom to talk with Walkup about what the area choir would need in the future. When firefighters enter a burning home, their first priority is to save lives by picking a wall and following it around the structure, sweeping room to room. Marion County Fire-Rescue Lt. Trish King said that takes precious time. For some of McIntosh’s historic district residents, it could be time their sprawling, historic homes, with unusual floor plans might not allow them. King offered the McIntosh Town Council a solution at last night’s meeting in the form of a pilot program for residential fire preplans. Marion County Fire-Rescue prepares fire preplans for businesses once a year. She said a preplan is not an inspection, but a plan for how to best save lives and fight a fire at that location. If firefighters already had information about where bedrooms were in a home and other vital information, they’d have a better chance of saving lives and saving their homes. Assigned at the Orange Lake station south of McIntosh, King has been with Fire-Rescue for 17 years, lives in an older home herself and is familiar with McIntosh. She said there are a number of old homes in the fire zone her station covers, but McIntosh has a large concentration of large homes and fire hydrants. Preplanning historic homes in McIntosh would help train firefighters on fighting fires in these kinds of homes. King is proposing a voluntary program and targeting residents with ballon-frame construction – which can be single-story homes or larger - because of their special vulnerabilities to being quickly consumed by fire. She said residents who live in homes built in the 1800’s or the early 1900’s stand a good chance of being ballon-frame homes. Ballon-frame homes were constructed in the 1800’s and early 1900’s in a similar way to how prefab homes are constructed today, King said. The frames of the homes were built on the ground and then tipped up, meaning that the vertical frames and the perimeter walls of the home go from the ground floor to the attic. If a fire starts in a first floor bedroom, it can spread quickly up the house. King said she came up with the idea for the McIntosh area by adapting fire preplans firefighters regularly do for businesses and other residential areas. She explained residential preplans are voluntary. Fire officials can’t come onto residential property to check if their ladders will reach a bedroom, or gauge how close a home is to a hydrant, without permission of the owner. Residential inspections have been done in Marion County in the past to help emergency personnel respond more quickly. King said they preplanned John Travolta’s Jumble Air home. Special security issues made preplanning vital for firefighters so they could not only get into, but out of his home in case of fire. 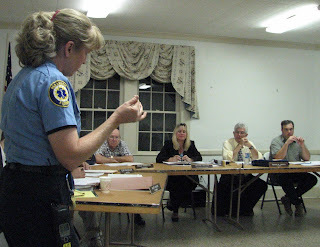 Town clerk Debbie Miller asked how about the security of the information gleaned in a residential fire preplan. King said the information from the preplans is secured at the stations. She said that it is used through their 911 system. If a call goes out for a fire in a preplanned home, that information would be available to firefighters if they were dispatched to a fire. Resident June Glass, chairwoman of the historic committee, asked King if preplanning would really help save an historic home because the wood used in some homes is lighter and burns quickly. King said that the best defense is smoke detectors. Peveeta Persaud, public education specialist for Marion County Board of County Commissioners, said their program is one of the most aggressive in the country. They provide two dual-mode smoke alarms that use both photo-electric and ionization technology for detecting fires for every home that requests them. The alarms are installed and tested by firefighters, free of charge -- which is funded by illegal burn citations. King said residents can contact Persaud about the smoke-alarm program or fire preplans. Residents in homes that fit the criteria for the preplans King is initiating can have both done at once. Information will be available at the town office. But Council Vice President Lee Deaderick indicated he didn’t see it as a council issue. King would like to know if residents are interested in the program. In a phone interview Friday, she said another reason she proposed the idea to the council involves training firefighters in how to approach fighting a fire in homes like McIntosh. “It benefits everybody,” she said. King that residents with questions about the preplan, or who want more information, can call her at station 9 at 352-438-2909. Residents who are interested in setting up a preplan or installation of fire alarms can reach Persaud at 352-291-8064, or e-mail peveeta.persaud@marionscountyfl.org. The Town of McIntosh swore in four new town officials last night and honored three for decades of service to the town. Councilmen Willie Hamilton, Lee Deaderick and Thurman Kingsley took their oaths of office with the new mayor, Cary McCollum. 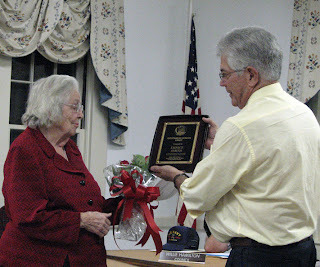 Roses and plaques were presented to former Councilwoman Eunice Smith and former Mayor Marsha Strange. Council President Frank Ciotti also noted former Council Vice President Howard Walkup's nearly 20 years of service to the town. The three officials decided not to run when their current terms expired this years. The council re-elected Ciotti as council president and elected Deaderick as the new council vice president.